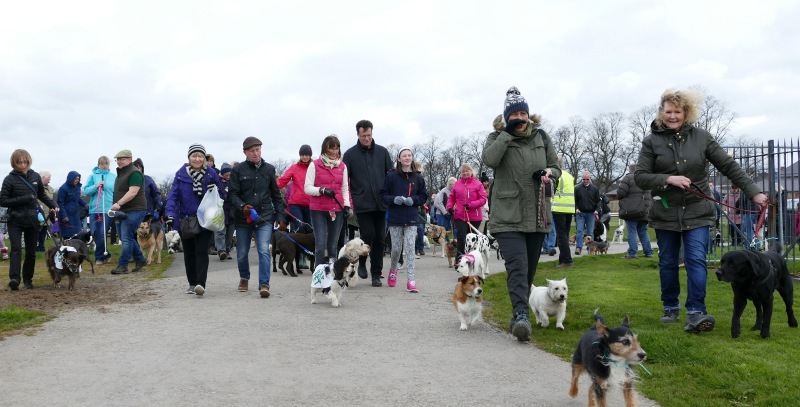 For the last five years York charity scheme ‘Keep your pet’ (KYP) has organised a fundraising dog walk on the Knavesmire, & this has become a firm fixture in dog-owners’ diaries. 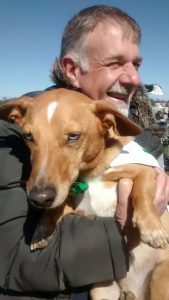 The event has grown year-by-year, with last year 120 dogs & over 150 owners taking part, & a record £1,500 raised. They’re off! Last year’s dog walk in action. This year’s event promises to be the biggest & best ever, as ‘Keep your pet’ (KYP) has been selected as one of the Lord Mayor’s charities for 2017/18 & the event is being run jointly with the two other charities – Hearing Dogs for Deaf People & Refugee Action York. The Lord Mayor, Cllr. Barbara Boyce, will open the proceedings & Jonathan Cowap of Radio York, famous for his irrepressible enthusiasm, will again be Master of Ceremonies. Jonathan, who has been a supporter of KYP since its launch in 2012 but who has no dog of his own, will again walk a borrowed dog called Henry, with whom he has become firm friends. There will be home-made cakes, savouries, soup & hot drinks on sale, stalls selling books, crafts & toys, a Hearing Dogs demonstration, competitions including ‘waggiest tail’, ‘sit for a sausage’ & ‘dog most like their owner’, dog portraits, a dog agility course for all comers, spot prizes, a tombola & a dog tombola, live music provided by local groups ‘Dynamics’ and ‘Strewth’, & a fun addition for this year is fancy dress for dogs & owners – which is optional ! Walkers can register from 10.15 and there will be events taking place from then until the start at 11am. Entry fee £5.00 per dog or family. The entrance is from Knavesmire Road, near the Racecourse buildings. Walkers can do any distance they wish and will be given a completion certificate. First York have announced timetable changes to a number of services, including the no. 11 Bishopthorpe service. Journeys retimed 10 minutes earlier which means travelling into York, there are more connections with the London and Leeds trains. The journey from Bishopthorpe and Ashley Park used to run out of service. This will now run in service. An additional evening journey has been added to remove the 90 minute gap to and from Bishopthorpe. Also note that there are some temporary changes to evening no 11 services while roadworks take place. On Sunday to Thursday nights between the 8th and 20th April, from 2030 to 0500 there will be diversions in the city centre due to the resurfacing of Lendal Gyratory and the surrounding roads. The work is planned in 3 stages, however there is no set order for when each stage will start and finish so the diversions will continue throughout. The changes for no. 11 are these. You can see the full details on the First York website, through this link.